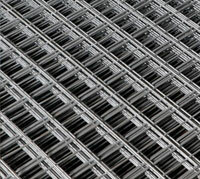 Weldmesh® is a welded steel wire mesh manufactured from bright drawn Galvanized wire, electrically welded at the intersections. Because it is welded it can be cut or bent to the shape required without the wires falling apart and forms its own selvage when cut flush. Weldmesh® is manufactured in flat sheets with grid spaces 50mm x 50mm, 75mm x 75mm and 75mm x 50mm, with wire diameters of 2.5mm and 4.0mm. The physical properties of the wires used are rigidly controlled to produce a welded mesh which has maximum weld strength combined with ductility. Plain steel Weldmesh® is similarly manufactured in flat sheets with squares 75mm x 75mm and 75mm x 25mm from 4.0mm diameter wires. Welds: All intersections are resistance welded without reducing the tensile strength of the wires and the welds have an average shear strength equal to 80 per cent of the wire strength. 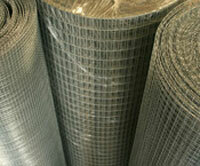 Finish: Where Weldmesh® is supplied with a galvanized finish, the zinc coating is to BS443. This range of mesh products is referred to by several names (galvanized hardware cloth, hot dipped screen wire, galvanized screen wire) and are an economical choice for industrial, agricultural and some residential uses. 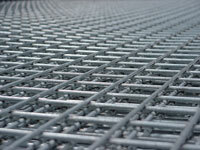 Fine mesh products are first welded before the galvanize coating is applied by a hot dip process.